Purchased with the help of The Fellows Acquisition Fund; The Institut de Recherche sur les Miniatures Armeno-Byzantines; The Manoogian Simone Foundation; The L.W. Frohlich Charitable Trust, in memory of L.W. Frohlich and Thomas R. Burns, in recognition of their interest in and contributions to the arts of the written word; The Hagop Kevorkian Fund; Kaloust P. and Emma Sogoian; Antranig and Varsenne Sarkissian; and an anonymous donor in memory of Sirarpie Der Nersessian, 1998. The original manuscript, M.740, was made for Marshal Ōshin in 1274; owned by Ohan of St. Sargis in the 15th century (colophon on fol. 238); this missing donor portrait leaf was long in private hands (Feron-Stoclet Collection, Brussels); purchased by the Morgan Library in 1998. Ms. gospel book single leaf; inscribed and illuminated in Turkey, Cilicia, Sis, in 1274. 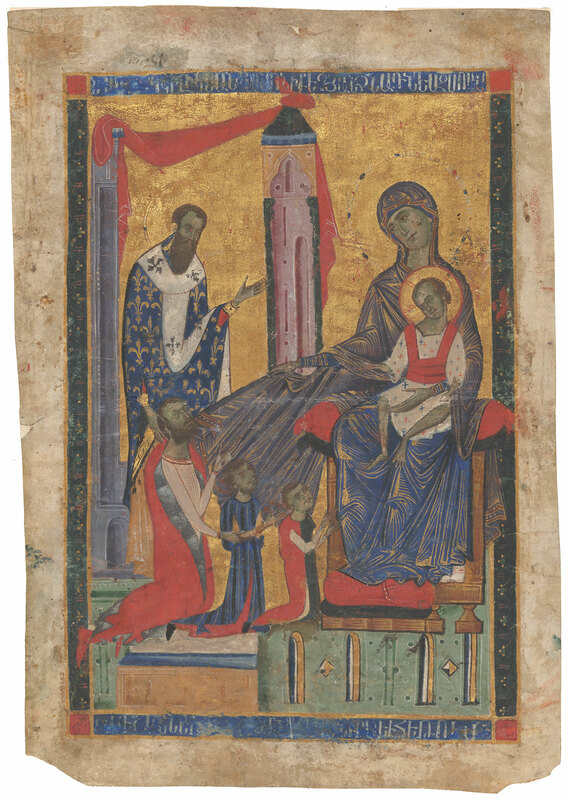 Decoration: 1 full-page miniature depicting the donors, Marshal Ōshin and his sons Kostandin and Het'um, and Archbishop Yohannēs presented to the Virgin and Child [the family portrait page from M.740]. Dated by scribe Kostandin in colophon in M.740, on fol. 316v. Previously glued to cardboard mount, removed July 2000 and matted. erkat'agir, one word in bolorgir.